This is the last recipe of this first week of international-themed Thanksgiving dishes. We started with Mexico, proceeded to East Asian and stopped in North Africa. The journey concludes in London, where chef Jeff Cerciello of Farmshop found the inspiration for this Moorish-style dish, which was featured in Food & Wine. Parsnips are slightly sweet and also a bit bitter when raw, but when roasted have a wonderful earthy-caramel sweetness. It plays nicely with the dates in this dish. I modified this recipe from the original by reducing the amount of olive oil used, cooking the parsnips longer so they got a little brown around the edges, and using an oven-safe skillet so that I could sauté the vegetables and roast them in the same pan. 2. Heat olive oil in a large oven-safe skillet over medium heat. Add the garlic and sauté until golden, a few minutes. Add the parsnips and cook, stirring occasionally, until golden and barely tender, about 15 minutes. Add the dates, marjoram sprigs, salt and pepper. 3. 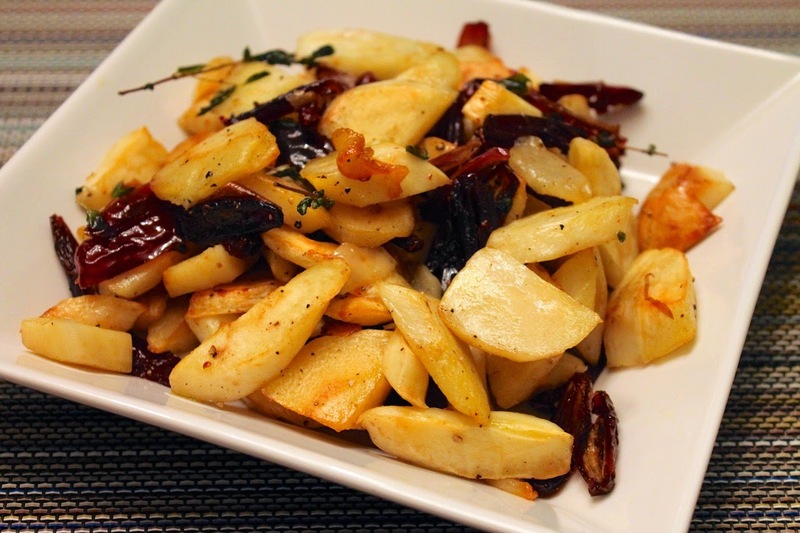 Transfer the skillet to the oven and roast under the parsnips are tender and lightly browned, about 15 minutes. Transfer to a serving bowl. 4. While the parsnips roast, combine the yogurt, lemon juice and sumac in a small bowl. Serve alongside the parsnips.